Since 1996, Cabin Creek Timber Frames has specialized in building hand-crafted timber frames for the Southeastern United States and some farther away. We have a history of building for a wide range of projects, including large and small homes, commercial projects, such as “party barns” and event buildings, churches, chapels, and other architectural structures as gazebos, pavilions, and stables. To save you, the homeowner, money and time, we urge you to engage us, the timber framer, in the planning process, from the very beginning. Foundations and more for timber frames must be engineered and designed differently from those of stickbuilt structures. Please contact us to arrange a complimentary consultation at our beamery. No matter the type of structure, each client has a close working relationship with our team during all phases of the work, including planning, building, and raising of the frame. We believe that our work must meet the highest standards for quality and we choose hand crafting because we firmly believe that it allows us to create the most beautiful and tightest fitting frames. Explore our site to learn more about us and the services we can offer you. You’ll find pre-prepared timber frame design plans to help inspire you, and provide ideas, tips, guides, photos, and articles to help you learn about Cabin Creek Timber Frames and the craft of timber framing. Since our beginning, Cabin Creek Timber Frames has specialized in the design and construction of hand crafted timber frames. Our timber frames become dream homes, stunning commercial structures, and other architectural visions, including gazebos and pavilions. Each timber frame we build starts as a design in CADworks software and comes to life at the hands of our artisan wood craftsmen. These artisans carefully select the timber and cut the frame using hand tools to carry out traditional joinery techniques. We assemble each frame in our Beamery to ensure a tight fit before our team raises it at the building site. We are experts in the use of timber and can maximize each timber and joint to make a structure of outstanding beauty and durability. Our commitment to our customers is delivering the finest quality hand-crafted timber frames possible at a reasonable price. We are passionate wood crafters from the large to small scale, and we’re here to help you bring your ideas to life. Our craftsmen’s skills in building full-scale timber frames can also be used on smaller projects. We’ve built furniture in many different styles, over the years for our clients including beds, bookshelves, and tables. Many of our craftsmen also have a background in artistic woodworking, including wood lathe work. Cabin Creek Timber Frames primarily serves the Southeastern United States from Florida and Louisiana to Virginia. 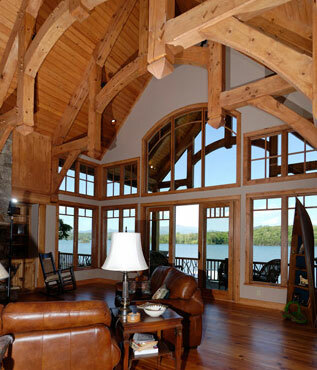 We have also worked with clients to design, handcraft and raise timber frames in New York State, Kansas and Michigan. Cabin Creek will consider designing and raising a timber frame in any of our contiguous forty-eight states. We have designed timber frames to be built in Alaska. Cabin Creek Timber Frames offers a variety of services that can be used from start to finish to complete a timber frame building project. We also consult for other businesses and professionals as our services allow. We can design a timber frame plan for you from the ground up or offer you pre-prepared plans that meet your needs. All design work is completed in CADworks design software. To meet state regulatory requirements, we also submit our plans to a structural engineer for approval. We have been licensed to grade heavy timber since 2002 and meet state requirements for heavy timber grading. We are also experienced in the selection of timber for framing purposes and can offer expertise in the choice of timber to maximize the quality of the timber frame, both aesthetically and structurally. We do use naturally shaped timbers in some positions. Our timber framers are artisans who prepare the frames using traditional hand crafting methods. We do not allow another company to cut the frame for us and we do not use a computer controlled machine (CNC). We believe that hand crafting enables us to build tighter, more accurate joints and create stronger, better looking frames. Our craftsman raise the frame themselves, using octagonal locust pegs to secure each joint. We also ensure a level and plumb frame by cutting the posts to the correct length on the job site before final assembly. These small cutoffs are the only waste we contribute to the job site. The Cabin Creek Timber Frame team may apply tongue and groove to the ceiling of the timber frame and the structural insulated panels (SIPs) to the exterior as the client wishes. Cabin Creek Timber Frames Owner, Joe Bell, has been making octagonal locust pegs since the 1980’s. The octagonal pegs have edges or wings that are slightly wider than the 1 inch round hole and bite into the wood that is surrounding the hole. Octagonal pegs can be removed, but only by driving them out with a heavy mallet and the use of a metal rod. We have made many thousands of octagonal locust pegs to use in our timber frames buildings and have sold many thousands more to others timber framers, usually timber frame restorers, for their projects. Cabin Creek Timber Frames use octagonal locust pegs for our clients at no increased cost. Round oak pegs sold by others may often be pulled out of the 1 inch peg holes by hand after the pieces have settled into each other. Our manufacturing facility in North Carolina is housed in a radiant floor heated warehouse that we call the Beamery. In the Beamery, timber frame construction and storage can be managed in controlled conditions for maximum accuracy. Each timber frame is fully assembled inside the Beamery to assure a quality fit before it is finally raised on the job site. Our craftsmen are deeply experienced in the art of hand cutting joinery. Each joint is checked by two timber framers before cutting, then scored with a sharp knife and cut by hand. The joint is then planed or chiseled to the scored knife line. After cutting the joints, all end grain is coated with a wax-based sealer to decrease checking as the wood dries. To see our work in action, watch this quick video or visit our YouTube channel. Our timber frame craftsmen are a unique group. Not only do they have a love of wood and the working of wood, they have a desire to create an object of beauty and durability, and in the process, the development of pride in their creation. This pride is shared by them and the subsequent home owners. Craftsmanship is enhanced by the framer’s and owner’s knowledge that the frame will be seen, enjoyed, and admired by the residents and visitors for centuries. Ruth and I want to thank you and the whole Cabin Creek team for all the effort and hard work you put into our home. You did a beautiful job. Heads look up and say, ‘I can’t believe it.’ They really like it, and come back with kinfolks and friends. It is very energy efficient. Average bill this summer was $52. Very quiet. Can’t hear anyone drive up in driveway. Cabin Creek cares about what they turn out. They don’t (just) cut and ship. These folks are craftsmen. Excellent! Joints are tight. The design, which you worked out for us, is outstanding. 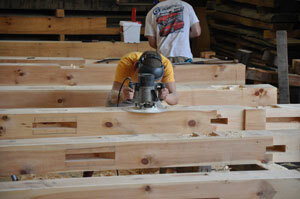 Since you started with planed timbers, it was easy to finish the frame. The timbers are beautiful. People are saying this is where they would come in case of a tornado or hurricane. The hammer beam bent makes a special impression. Our experience in dealing with Cabin Creek was enjoyable, from planning to raising. And we can recommend Cabin Creek without reservation. The house is beautiful—just as pretty as the ones in the magazines. Many of our friends have never seen a timber frame. We love the frame and loved watching it go up. We highly recommend Cabin Creek. We feel very fortunate to have a frame that is such a work of art. The craftsmanship of our frame is very impressive. Having a timber frame on a tight budget is possible. We feel that our frame is one of a kind, and that the men who built it are very talented. We are very fond of Cabin Creek and the service we received through the construction process. We enjoyed working with Cabin Creek and felt like we were part of their family. We are also very pleased with the quality and craftsmanship of our timber frame home. We like to show it off and really are looking forward to the day when we are living there on a permanent basis. We would be more than happy to tell our story to anyone interested in purchasing a Cabin Creek Timber Frame home. I’m very proud of my Cabin Creek timber frame. It has created quite a stir in the community. John, I need to pass along a couple of well-deserved compliments. Both Tony and Roger were very impressed with your job today. Those guys do not pass compliments unless they are earned. Hats off to you for a good job. Nice product and thanks for everything. We are excited about this one and have talked about even trying to put it in Southern Living.